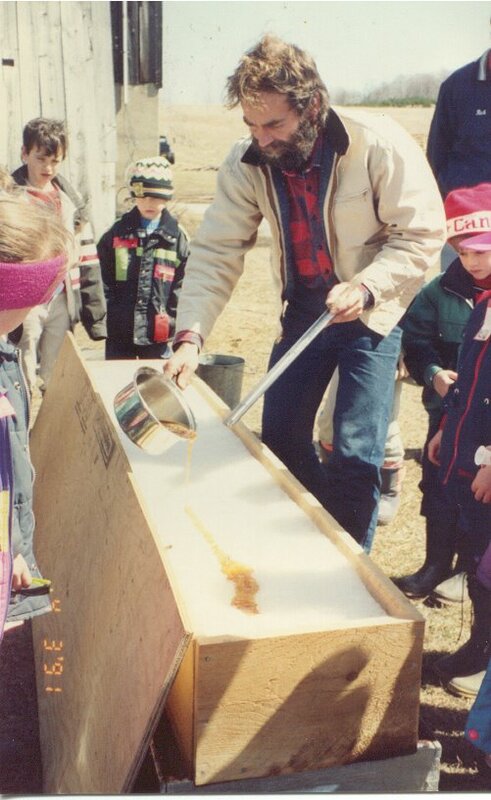 Most maple fans have had the experience of visiting a maple farm during syrup season and being treated to a sticky helping of sugar-on-snow. The traditional maple treat is made from nothing but pure maple syrup, however, if you tried to pour the bottle from your fridge on the snow bank in your yard, you'd be sorely disappointed. What's the trick? Unlike hardwood carving, you CAN try this at home... (Ask your Mom and Dad first) Boil approximately 1 cup of pure maple syrup (Aunt Jemima's won't work!) until it reaches 236 F on a candy thermometer. If you boil the syrup a little less, it will be very soft and sticky. It you boil it a little longer, it will be more brittle. Pour syrup directly over clean snow or crushed ice. You may pour small round servings, or choose to pour strips which can then be rolled onto a popsicle stick. Either way, prepare to get sticky, and watch out for loose fillings!